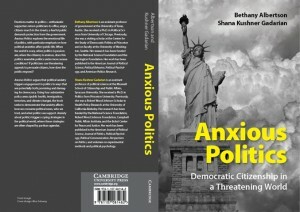 My book, Anxious Politics: Democratic Citizenship in a Threatening World, was written with Shana Gadarian of Syracuse University and published by Cambridge University Press in 2015. We were co-winners of the 2016 Robert E. Lane Award, Political Psychology Section from the American Political Science Association. Contemporary American political life abounds with crises and worry. Terrorist attacks, a warming planet, and flu pandemics all trigger the public’s anxieties. Meanwhile, politicians use fears of economic downturns and cultural changes to evoke the public’s worries about immigration. 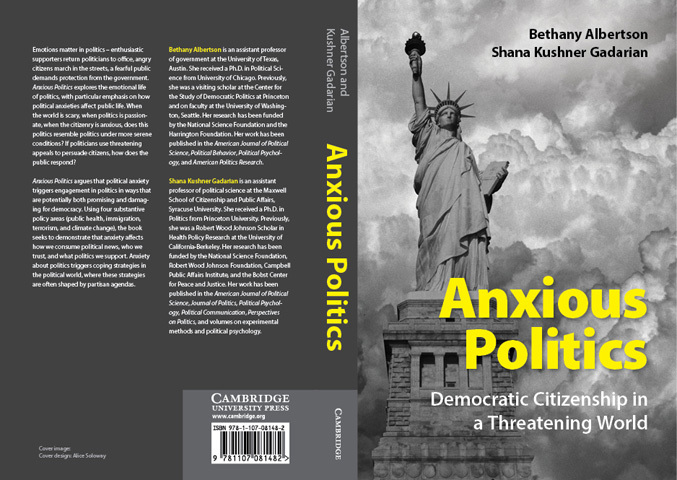 Given that politics often involves anxiety, in this book we ask how and when is anxiety successful at causing citizens to engage with politics? In addition, we ask what is the substance of that political engagement? Political thinkers and democratic theorists express concern that anxiety may undercut citizens’ abilities to make rational political choices, yet recent research from political science and psychology paints a more hopeful picture of anxiety, suggesting that it may lead to more knowledgeable and trusting citizens. Learning: Political anxiety leads citizens to learn more about politics, and anxious citizens are systematically drawn to threatening news. Political Attitudes: Anxious citizens are systematically more likely to support protective and potentially anti-democratic policy positions. We use multiple policy areas (immigration, public health, climate change, and terrorism) to test how anxiety affects citizens’ engagement with political information, trust and attitudes. Importantly, these issues vary in their relationship to partisan politics. When an issue is closely associated with a political party (for example, immigration for Republicans and climate change for Democrats), partisanship can shape the ways that anxious people engage in politics. Anxious people seek out threatening news, but partisanship affects who remembers that news. Anxious people put their trust in relevant, expert figures, but on partisan issues, anxious people trust the political party seen as more effective on that issue. Finally, anxious people are drawn to policies that protect us from threat, and parties compete to offer protection. Our attention to the partisan side of anxiety in politics allows us to paint a fuller picture of the ways that anxiety shapes political life than accounts that either simply vilify or praise the role of emotion in politics.